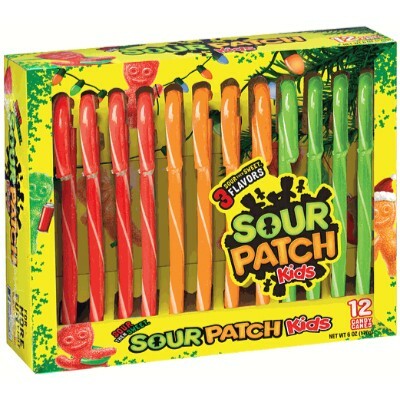 Will the sour-then-sweet Sour Patch Kids make it onto the Nice List this year? A twist on the classic mint candy cane, the Sour Patch Kid Candy Canes combine a new sweet and tart flavor and the iconic shape of this classic Christmas confection to create the perfect gift for anyone with a sweet tooth or a quirky and edible decoration for your Christmas tree at home! 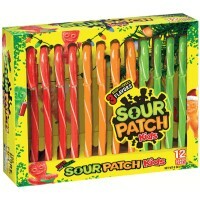 Sugar, corn syrup, acidity regulators E330-E296-E331, natural and artificial flavors, colors E129*-E110*-E102*-E133. *May have an adverse effect on activity and attention in children. Contains GMO. Nutrition facts (for 100g): calories 429Kcal, total fat 0g (saturated fat 0g), total carbohydrate 100g (sugar 78.6g), protein 0g, salt 0g. Lasciano la lingua colorata e hanno un ottimo sapore alla frutta!! !